With winter wheat stands in some areas being less competitive with weeds this year (Figures 1 and 2), fields not treated with herbicides during the growing season now have substantial weeds that will need to be managed. Let’s first review growing conditions for this year’s winter wheat because that affected how competitive the crop was with weeds. 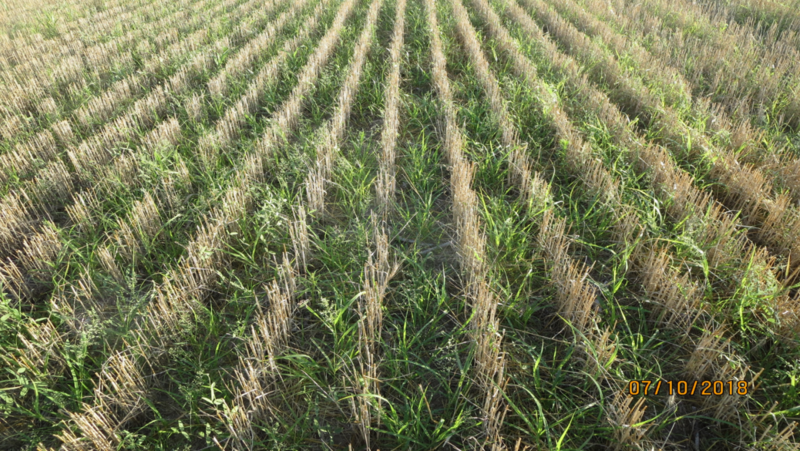 Timely control of weeds after winter wheat harvest can limit soil moisture loss to weeds and prevent the deposit of more weed seeds in the soil, two factors that can benefit the next crop’s yield. In addition, timely control of volunteer wheat is essential in reducing the spread of wheat streak mosaic disease. The timing of control of volunteer wheat can also be affected by temperatures during grain fill and the length of dormancy. Dormancy can be reduced by higher temperatures during the later stages of the grain fill period. Normally, the grain-fill period is 25 days or less, but it can exceed 35 days under good environmental conditions. Any temperature over 85° can reduce wheat yield potential. Therefore, if higher temperatures occur during the later stages of grain fill, the dormancy period will be shortened and control of volunteer may be needed sooner than normal after harvest. Weeds under stress are difficult to control. Kochia and Russian thistle are day-length sensitive and will begin to flower toward the end of July and into August. It’s a general rule that you can wait up to 30 days after harvest to spray wheat grown as part of a three-year rotation. 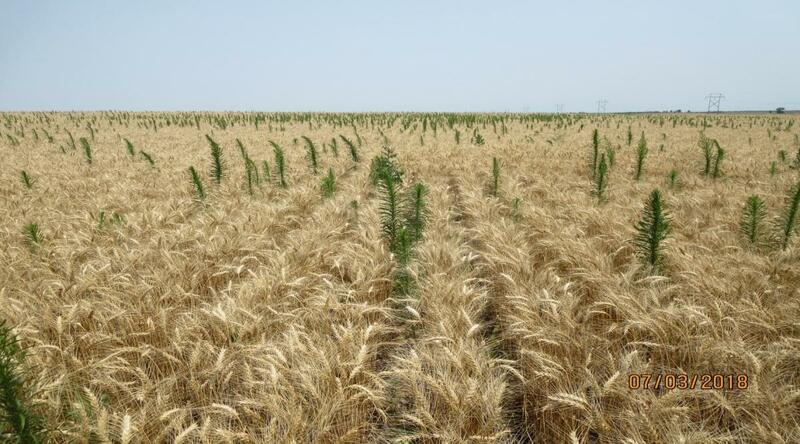 If the wheat was planted without an 11- to 14-month fallow period, spray it within 15 days of harvest. Examine each field separately and adjust your treatment schedule accordingly. This year some fields will need to be sprayed before 15-30 days because of the less competitive winter wheat stands and higher precipitation amounts in some areas. The key is to prevent weeds from using soil water and producing weed seeds. As with all weed control, it’s essential that you closely watch for weed developments and spray at the proper time noted on the label to achieve maximum control. Most labels state that weeds must be treated before they are 6 inches tall. If weeds are under severe drought stress, wait for rain and spray about a week later. Ammonium sulfate is especially helpful when stress conditions are present. Liquid ammonium sulfate, with or without a drift retardant, also is available. It’s difficult to recognize weed stress so it’s wise to always add ammonium sulfate. Improve control by increasing the rate of glyphosate. Do not exceed the label use rates. Allow at least six hours — and longer with some weeds — for the glyphosate product to become rainfast. Barnyardgrass may require 24 hours without rain for maximum control. With glyphosates, use a spray volume of 5 to 10 gallons per acre and don’t apply when temperatures reach or exceed 90°F. Producers should control weeds in wheat stubble fields by applying the full label rate of glyphosate with the additional herbicides. Be careful in selecting herbicides used near susceptible crops or other sensitive vegetation. Other herbicides may be added to glyphosate. 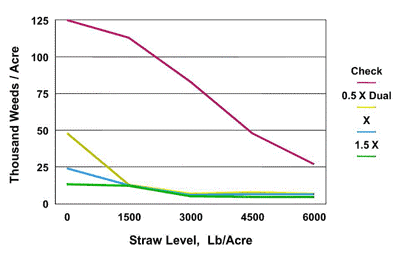 Sharpen may help with control of pigweeds and provide some residual control. Sharpen works best with the addition of methylated seed oil and can provide some pretty good burndown on smaller weeds. However, if the weeds are very big, it tends to burn the tops and plants eventually resume growth. Sharpen requires complete coverage so using 15 to 20 gallons/acre spray solution is important. One herbicide alternative to glyphosate that can work well to control emerged pigweed and kochia is paraquat. Paraquat is a contact herbicide, so spray coverage is critical. Spray volumes of 20 gallons/acre or higher are preferred, especially on larger and thicker weeds. Paraquat also needs to be applied with a nonioinic surfactant or oil concentrate to enhance surface coverage of the plant foliage. A tank mix with atrazine will enhance control and provide some residual weed control if planning to plant corn or sorghum next spring. Likewise, metribuzin can be tank-mixed with paraquat if rotating to soybean to enhance control and provide some residual. If planting wheat this fall, a tank mix with Sharpen is an option to provide some residual control. Recent work suggests that applying paraquat as soon as possible following wheat harvest allows for better coverage and more effective control, especially of pigweeds. Another herbicide that can be added to the burndown treatments for residual broadleaf weed control in wheat stubble is flumioxazin (Valor and others). Flumioxazin has been used as a preplant/preemergence treatment in soybeans for years, but it hasn’t been used much in wheat stubble because of the cost. However, with the recent reduction in flumioxzin prices, it may be cost effective. Control with flumioxazin will depend on rainfall for activation, just as with the preplant treatment in soybeans. If temperatures are above 80°F, use the amine formulation of 2,4-D. Do not use 2,4-D or dicamba if sensitive crops or other vegetation may be affected. For additional information, treatments, and rates go to the Ecofarming Section of the 2018 Guide for Weed Management, EC130. Several options are available for using nonselective herbicides with difficult-to-control weeds. With Gramoxone Inteon, use a minimum of 2 pints of X 77, or equivalent surfactant, per 100 gallons of solution. Use 2 quarts of X 77 per 100 gallons of spray solution if using less than 20 gallons of carrier. The active ingredient varies among products so check labels and adjust rates accordingly.